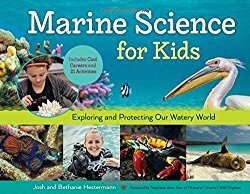 Today at Growing with Science Blog we are featuring Marine Science for Kids: Exploring and Protecting Our Watery World, Includes Cool Careers and 21 Activities by Bethanie and Josh Hestermann, with a foreword by Stephanie Arne. This is one of the fantastic Chicago Review Press books that combine great information with fun hands-on activities to reinforce learning. Throw in beautiful color photographs of awesome animals and mini-biographies of marine science professionals, and you have a treasure trove for middle grade readers. The book starts with a time line of some important historical events in the field of marine science, with references to discoveries made and boundaries pushed by the likes of Jacques Cousteau, Marie Tharp, and Sylvia Earle. Then right off the bat, the reader learns what marine science is. Did you know marine scientists study not only saltwater creatures in oceans, but also those found in rivers and lakes? Now the reader can hop to the chapter that covers their favorite habitat, such as the coast or deep ocean, or they can read from cover to cover. There’s so much to discover. Testing methods for cleaning up an oil spill, etc. With a glossary, resource list, and selected bibliography, this book is a useful reference for planning lessons beyond the book, as well. Marine Science for Kids is a must have for budding marine scientists, but will also entrance young readers interested in animals or the environment. It is a fabulous reference for educators, too. Don’t forget to check Growing with Science for more information and scores of related activities. Copyright © 2017 Roberta Gibson at Growing with Science All Rights Reserved. Categories: STEM Friday round-up | Tags: Marine Science for Kids | Permalink.